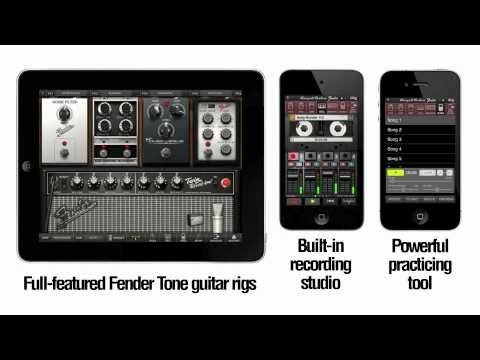 IK Multimedia released this teaser video for AmpliTube Fender for iPhone and iPad – The new AmpliTube Fender app for iPhone/iPod touch is full-featured Fender Tone guitar rig with a built-in recording studio. Now you can dial in your favorite Fender guitar amp and effects sounds with the new AmpliTube Fender mobile app for iPhone/iPod touch. In this video guitarist Chris Buono demonstrates how to set up some amp modeling and effects configuration’s in Amplitube. Amplitube is an amp modeling and guitar processing app from IK Multimedia that runs on Apple iOS devices like the iPad, iPhone and iPod Touch. Chris takes you through creating a setup from scratch and explains what each setting does and how to use it. For guitarists looking to add amp modeling to their rig but don’t want to use a laptop this is a great place to start. This is a preview of AmpliTube 2 for iPhone – the latest version of IK Multimedia’s portable amp-modeling software. AmpliTube iRig is a combination of an easy-to-use instrument interface adapter and guitar and bass tone mobile software. With AmpliTube iRig, you can plug your guitar into your iPhone/iPod Touch/iPad and jam anywhere. Simply plug the iRig interface into your mobile device, plug your instrument into the appropriate input jack, plug in your headphones, amp or powered speakers, download AmpliTube for iPhone Free and start rocking. You’ll have at your fingertips the sound and control of 3 recombinable simultaneous stompbox effects + amplifier + cabinet + microphone, just like a traditional guitar or bass stage rig. Add amps and effects as you need them — you can expand your rig with up to 10 stomps, 5 amps, 5 cabinets and 2 microphones in the AmpliTube iRig app custom shop.